Just some points to consider when booking a hairdresser for your special day. Please always consider the heat. Hair reacts differently to the heat and humidity when you are on holiday, so always let your hairdresser know if you hair does, as it may have an impact on the products and tools they use, and, the style you are wanting. Wherever possible, send your chosen hairdresser a photo of the style you would like, and, a photo of your hair. Some styles you like/want may not be suitable for your hair type. Plus each style will take your hairdresser a different amount of time to recreate, so this will give them an idea of the length of time they will need to be with you on the day. 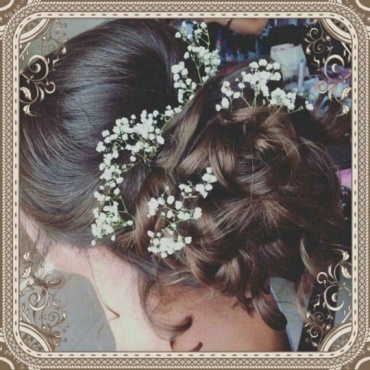 Always look at your chosen hairdressers testimonials and comments from past brides/customers. Also, have a look at the photos they post, to make sure you like their style. The most common fault, on the day, is hair falling out of place. If your hair doesn’t feel secure, or, if you’re not happy with your hair, tell them! Let them know you are not happy, so they can rectify it before they leave. Also, make sure you allow plenty of time for your hair and makeup to be done. It is better to be ready earlier than you need to be, so you can still be relaxed and enjoy your morning with your bridesmaids, than to be running late, stressed and run the risk of your ceremony not going ahead (the marriage officers don’t allow lateness).